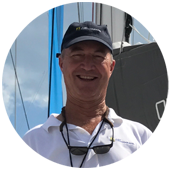 Just Catamarans Northeast broker Derek Escher explains the various methods of driving a catamaran, based on size, different catamaran makes, the location of steering within the vessel and more. 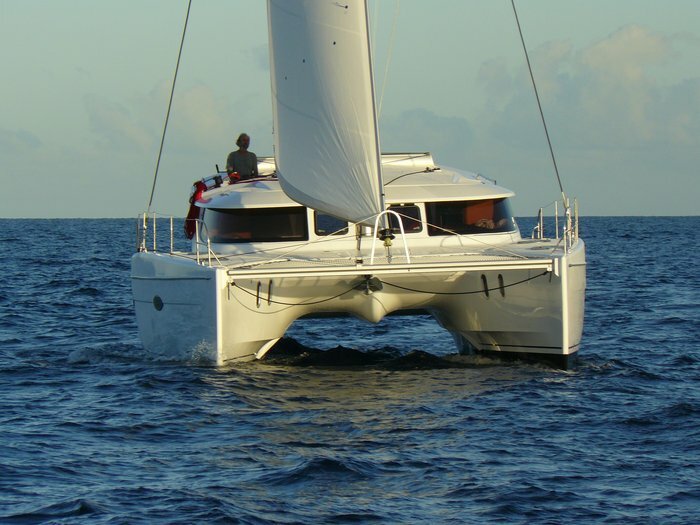 There are several discussion points nearly all serious catamaran buyers and owners eventually come back to. We hear about bridge deck clearance, daggerboards versus keels, galley up versus galley down, foam core versus balsa core, etc. The placement of helms on catamarans is another of these often-debated issues. While there is no one “right” way to design a catamaran’s helm station, it is vital to understand the pros and cons of each to settle on the design that best serves one’s needs. There are dual aft steering stations, bulkhead steering stations, forward steering stations, inside steering stations, joysticks, and, more recently, flybridge helm stations. Let’s quickly go through the pros and cons of different helm placements and how they impact the above six concerns. The outboard, aft dual helm stations preferred by Catana and older Privileges, among others, are great for seeing your sails, docking the boat (because you dock stern first where it is very easy to step off the transom and grab a cleat) and clearing enormous amounts of room in the cockpit. It is also really fun to sail a boat from these positions as you are right in touch with your trim and the sea, and most of these helms are mechanical as opposed to hydraulic, which means greater sensitivity and feel. The big negative for many people is exposure. Additionally, visibility to the other side of the boat forward of the saloon is extremely limited, especially while under sail. Catana always has had two helms, so walking back and forth across the cockpit is essential when navigating in a crowded harbor. Visibility. There is really nothing like sitting up on the windward hull looking up at the sails and the seas in front—it is very sporting. Docking is easier because you can sit at the helm station closest to the dock and slowly back in, have someone step off the transom steps that are in line with the dock and fix that first cleat. Then you just motor forward to secure the bow line. Cockpit space is much larger, allowing for bigger doors and windows between the cockpit and interior saloon. This enables the interior of the saloon to open up almost entirely to the aft cockpit, which makes for a very nice living arrangement in warm-water voyaging where you spend 90 percent of your time outdoors. Many sailors are passionately opposed to dual helms for exposure reasons. If it is hot and sunny, or rainy and wet, you are not very well protected from the elements. Fans of dual helms generally counter as follows: When voyaging you will be on autopilot 99 percent of the time, so why worry about sun exposure? Or cold or rain? When you really want to sail, you get the full enjoyment of it with two helms aft. When it is hot or rainy, let the autopilot do the work. If it gets nasty and you do need to helm a bit just sit inside at the warm navigation station and steer with a joystick or remote autopilot. Bulkhead steering is the most popular type of steering on cats. It is generally a single wheel on either the port or starboard side of the aft bulkhead of the main saloon. Usually, the helm station is covered by either a hard or soft-top bimini, often with a sliding, opening hardtop roof or zip-away canvas roof so you can enjoy the sun and weather when you want. These designs were popular on the older Lagoon 380, Lagoon 410 and Lagoon 470, Fountaine Pajots as well as on Dolphins, Outremers and a great many South African cats. On larger catamarans, you sometimes even find twin bulkhead helms, which are better for sailing and docking. The downside is that these helms take up a lot of the living space in the cockpit, often don’t allow for much of a view of the sails, and really aren’t that great for seeing the sides of the boat for docking. Protection—you can create a dodger of plastic around the front of the helm station on a bulkhead cat so that, whether it is rainy or sunny, you can fully protect yourself from the elements if you want to hand steer the boat in crowded quarters. Visibility—most bulkhead cats are designed to offer “four corners” visibility. If you stand up at the helm you can see both bows and both sterns when docking or sailing. Cheaper to build. A single bulkhead helm with a hydraulic system is a lot cheaper to build, driving down the cost of the construction of the yacht. You can run the main halyard and reefing lines back to the helm station, so you do not have to go to the mast to raise or lower the mainsail and can reef easily without going forward. Loss of cockpit space. A bulkhead helm station, especially if you want a helm that can seat more than one, takes up a lot of cockpit/living space. It also cuts down on the window space between the saloon and the aft cockpit and usually means you have to have a smaller sliding door. When docking short-handed you have to step down and then walk all the way back to the stern to grab a cleat. The steering is usually hydraulic, so it is less sensitive and therefore less fun to steer the boat. You cannot see the sail plan clearly and are not as “in touch” with the water, which makes it a bit less sporty. Forward cockpits offer great visibility and fun when sailing in light to moderate breezes and are usually backed up by an inside helm. Some boats utilize this concept with a forward (of the saloon) work area where all sheets, halyards and reefing lines are led, and then have an internal helm. Chris White designs and Gunboat are the chief proponents of these helms which are similar but with differences. I have sailed a great deal on these designs and the negatives are that forward helms are extremely exposed to wind, rain and spray. It is not unusual to be standing in 35 knots of apparent wind with serious spray and water crashing over you. In light air and small seas they are loads of fun and place you in wonderful contact with the winds and seas. In heavy air, well, they are closer to a fire hose. You really cannot “go forward” without wearing serious foul weather gear. Additionally, these cockpits take up so much space that there often is little or no room left for an aft cockpit. For this reason, forward cockpits are generally only found now on cats over 48 feet because the aft cockpit—where one spends most of their time on a cat—is simply too small. Forward cockpits offer an exhilarating sailing experience, and, most often, all of the reefing equipment is led to these stations. Forward cockpits de-clutter the aft cockpit—since all of the reefing and halyards are in the forward cockpit, the aft cockpit is free of “spaghetti”. Exposure. In large seas and strong winds the forward cockpit will be full of water (especially upwind) and you will often experience enormous apparent wind speeds. On the higher performance versions of these designs it is not unusual to see 35 knots of apparent wind and waves of water in a 15 to 20-knot pleasant sailing day, let alone in a real blow. If you have to go outside in strong winds and seas to take in a reef you will have to put on foul weather gear and must plan to get soaked. When you return inside you will be cold and wet and take into the boat a lot of cold and wet water as well. The entryway back into the boat becomes a mudroom and there is a strong possibility of a lot of water entering the saloon while exiting or entering the boat. The aft cockpit will be much smaller, therefore you really need a fairly long catamaran to have both a forward cockpit and a decent sized aft cockpit. Experiments with cats under 48 feet with forward cockpits have not been very successful. A doorway is required at the front of the saloon. This is an invitation to have water come into the boat, especially in nasty seas and winds with water rushing over your catamaran. 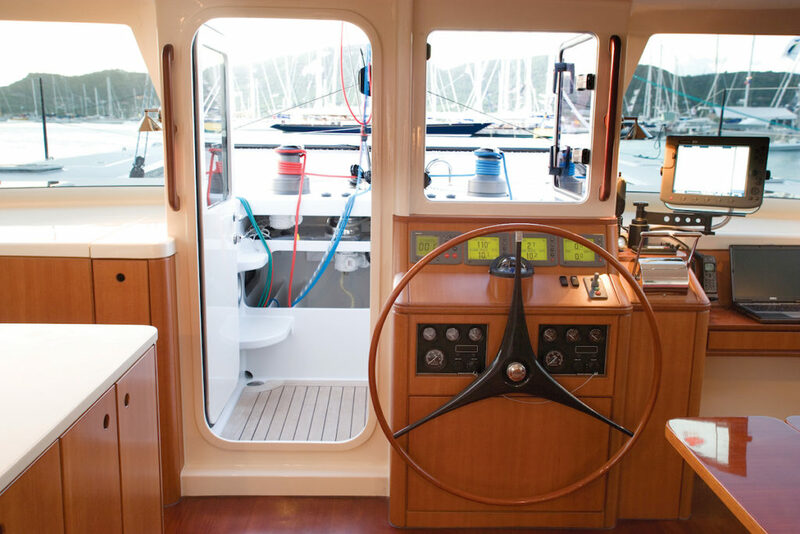 Many forward cockpit cats have interior helms so that you do not have to stand outside to pilot the boat in bad weather, but this will not alter the fact that you must still open that front door and prepare for the worse if you must reef or lower sails. In recent years, it became clear to several catamaran builders that nearly 35 percent of their buyers were coming over from a powerboat. As such, every effort was made to please this large new buying populace. So in addition to making sure the main saloon has a massive flat screen TV, front-loading freezers and “surround sound” beds, the flybridge became and remains wildly popular with a wide segment of buyers. And the fact is, if you are chartering a cat, or puttering about at sunset in the Med, a flybridge is fantastic fun. You can get the entire family up there, enjoy a few drinks, and take in fantastic views and sunsets from this top perch. Sunreef Catamarans even has one with a hot tub on it. Taking a soak while going from the Baths on Virgin Gorda to Foxy’s on Jost Van Dyke sounds like fun to me. The fact is, cats that feature fly bridges are designed mostly for parties, for charters, and for drinking rum. This is not a feature you see on really serious sailing boats under 60 feet, but you can’t be all things to all people. A forward helm, such as on the Gunboat offers fun sailing, easily accessed lines and a dry interior steering station. Cats with fly bridges are huge, comfortable and festive. Adding a flybridge frees up the entire aft cockpit and adds another social center to the boat. Visibility. A flybridge is excellent for seeing the entire boat, and all that is around it. Since most people do not pilot a flybridge cat in bad weather, most of them are set up with a nice forward-facing nav station that has a joystick or autopilot. Some even have engine controls placed inside. So the issue of exposure is addressed nicely with an entire helm station to compliment the flybridge. A flybridge makes minimum boom height extremely high. One of the principals of performance sailing is a called “end plate” effect. Basically, this means that the best performance comes from a sail plan that closes the gap between the boom and the deck of the boat. A flybridge opens this gap dramatically. Flybridges place the rig either very high off the water or it is very undersized, so that either you have a disproportionately high rig for the size of the boat, or you have an anemic sail plan, which is the case with most of these boats. Flybridges dramatically increase the windage of the catamaran and therefore slow the yacht down when pointing and close reaching. Flybridges place the skipper and whoever is up in the flybridge at the top of a fulcrum, so that when sailing “up top” you experience an enormous amount of fore and aft movement in lumpy seas. So, how do you decide, and what can you do to live with a less preferable placement on what would otherwise be a great boat? First off, consider your sailing habits. How important is it to you to be actively sailing your boat, or how much do you expect to use your autopilot? Are you prone to skin cancer? Sobering, but this is a real concern. How important is the cockpit size and ergonomics? How about the saloon, how do you feel about a big inside helm? Is your boat a condo away from home? Do you fancy a fine sailing yacht? What about a Catana if you are worried about your skin? It is possible to put a small bimini over those helms. This does seem to be the most objectionable thing about a Catana. A Catana is, however, great fun to sail and great to bring to a dock. What about a fine sailing boat with bulkhead steering, yet not being able to see the sails? Many people have added windows or hatches above bulkhead stations to see better. It is a compromise as well. In conclusion, steering positions on cruising catamarans are all compromised. If skin cancer is a concern and you love to sit at the helm for hours on end, you need a protected helm, and this should affect your decision. Otherwise, you should pick a boat for its overall package and adapt to the helms as they are. This is frustrating, but will not be a lasting concern. 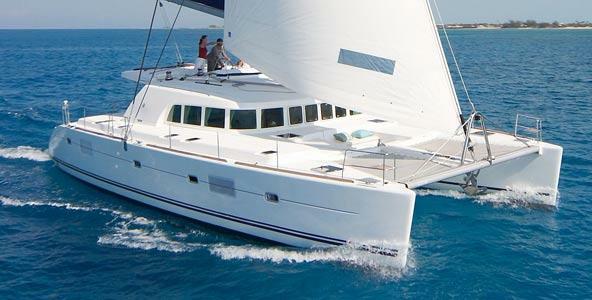 Speak with Derek Escher to help you find the right catamaran with the right helm.